Astor Place, New York City. These were taken on a trip to New York that Gary, Anne and I took a month ago. 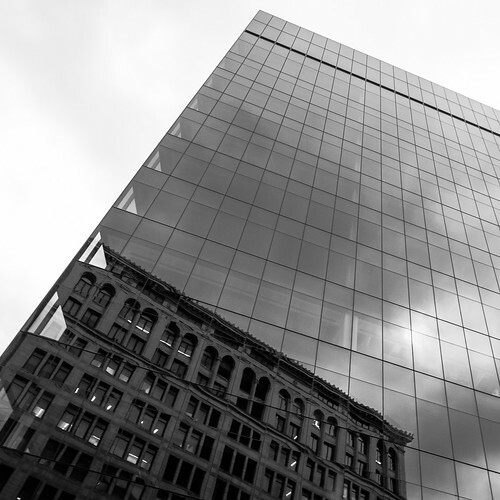 This particular building reflection caught my eye because it was so clear and because the left edge/corner of the newer building was sharp and shallow enough so that we could see through it. Also, it was dusk so there were lights on in the older building. Thee's something about seeing the inside of a monolithic glass box from the outside that has an appeal for me. Sort of like finding out how airplanes are honeycomb structures covered with a thin skin of aluminum (or whatever material their skins are made of). Lastly, this large face of the building was facing due west, perfect for picking up the sky and fading light.